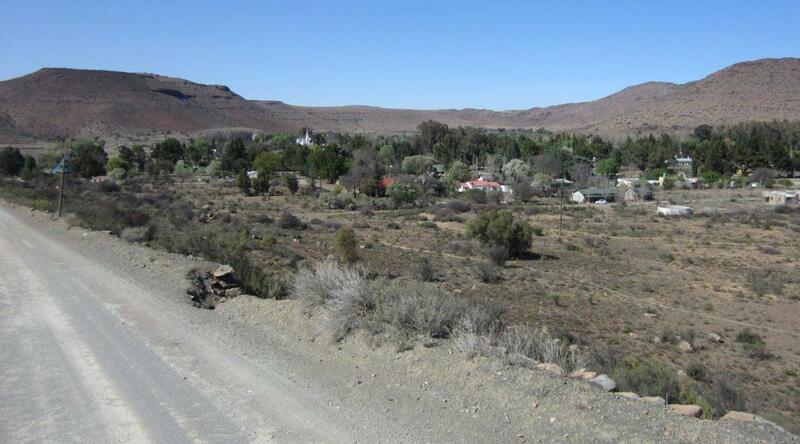 Explore the beautiful back roads and interesting little towns rather than speed down the N1 highway. Make this an opportunity to get to special out-of-the-way places like Nieu-Bethesda which is a good overnight stop between Johannesburg and the Southern or Western Cape. Nieu-Bethesda is a sleeping hollow with only dirt roads and no traffic lights. 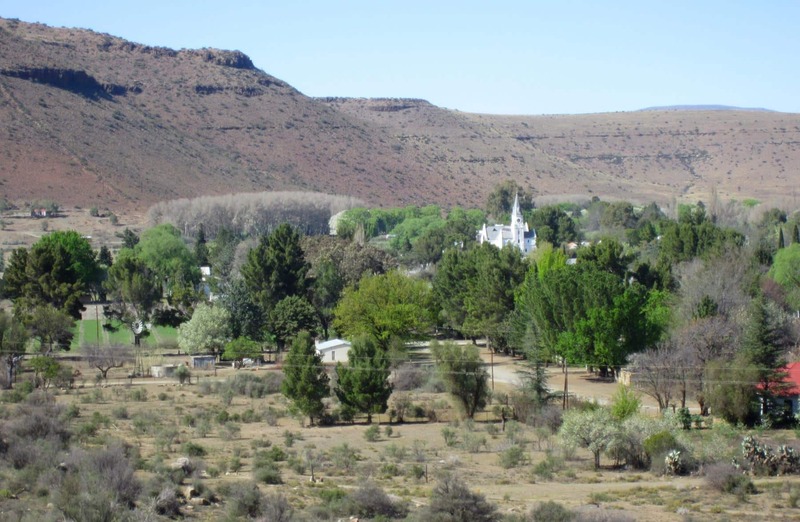 This sleepy hollow lies on a 51km loop off the N9 between Middelburg and Graaff-Reinet. One has to make a special effort to reach this out-of-the-way Eastern Cape Karoo town, unless you detour due south from the N1 just after Colesberg. Nieu-Bethesda is famous for the Owl House but the Kitching Fossil Centre is also worth a visit. In fact, ideally one should spend a whole day enjoying the ambiance and all this town has to offer. Stroll around and visit the various restaurants, coffee shops and galleries or take the kids for a donkey cart ride. Accommodation is available at a few guest houses and B&Bs; but there are also options in nearby Middelburg or Graaff-Reinet, as well as on surrounding farms. The beautiful Dutch Reformed Church. A welcoming coffee shop and B&B. 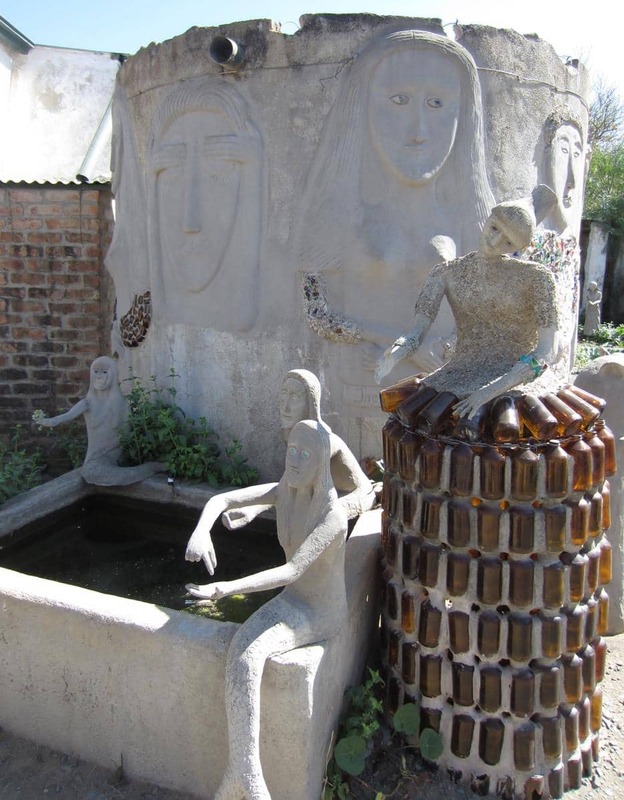 Local artist, Helen Martins, created her own fantasy world in her house and garden into which she gradually withdrew from the outside world. 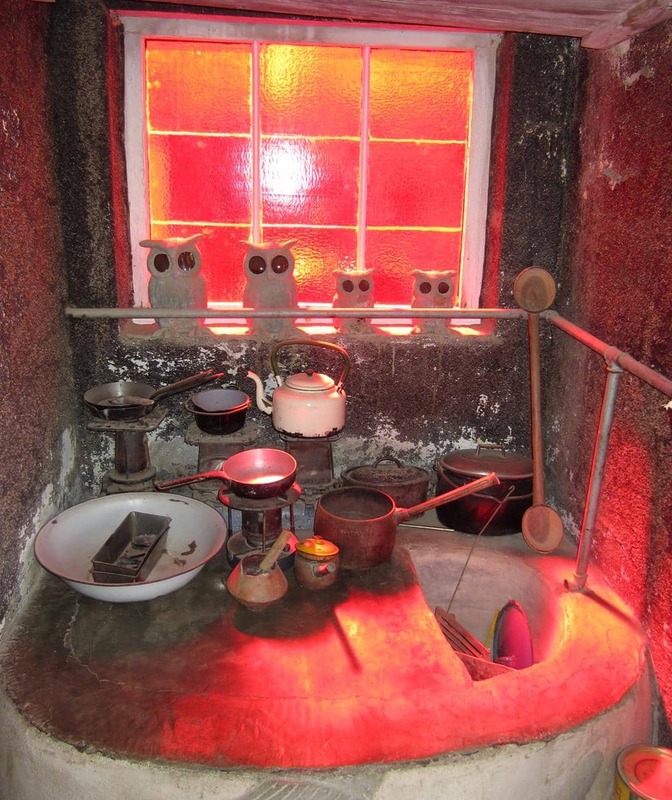 She had a fascination with owls, thus her house became known as The Owl House. It was her wish that this be preserved as a museum and that is indeed what has put Nieu-Bethesda ‘on the map’. 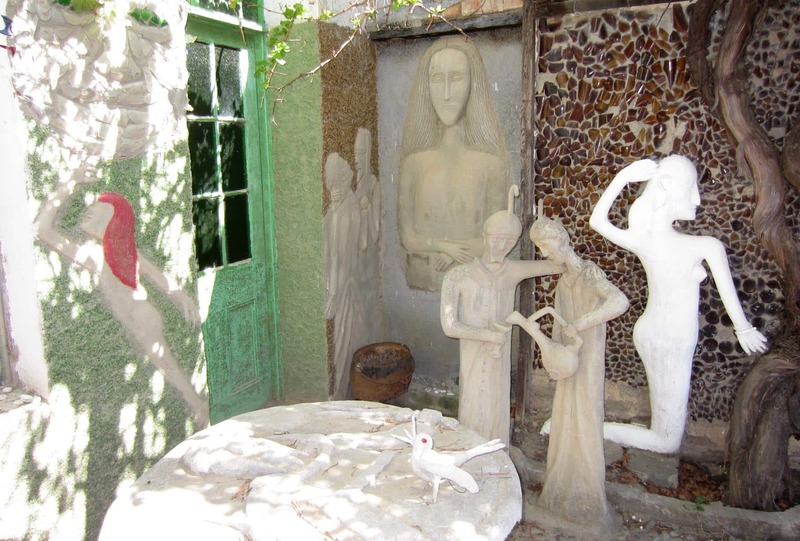 Since her death in 1976 her world of enchantment is preserved by the Owl House Foundation and is open to visitors, unlike when she was alive and creating her art. An owl keeps watch at the entrance to Helen Martin’s garden. Helen Martins, later known as Miss Helen, was born in Nieu-Bethesda as the youngest of six children in 1897. She was an intelligent girl and obtained a teacher’s diploma in nearby Graaff-Reinet before she married a local farmer. The marriage did not work out and Helen returned to Nieu-Bethesda in the 1930’s to care for her elderly and ailing parents. Her mother passed away first and her difficult and moody father then spent his time, with the aid of a social worker, in a windowless room, which she painted black and named the ‘Lion’s Den’ after he died in 1945. Then she was alone in this remote, small town and started to transform her house and garden into her fantasy world, today known as the Owl House. In later years, after her second marriage which only lasted three months, she became a recluse, only seeking the company of a few select friends. She also had a long-standing relationship with a visiting gentleman who lived outside the town but visited from time to time. Helen begun decorating the inside of the house by painting the ceilings in bright colours, fitting coloured glass to the windows and painting walls and doors with fine crushed glass. Sun faces are a common theme inside the house which she painted on some of the ceilings and windows. 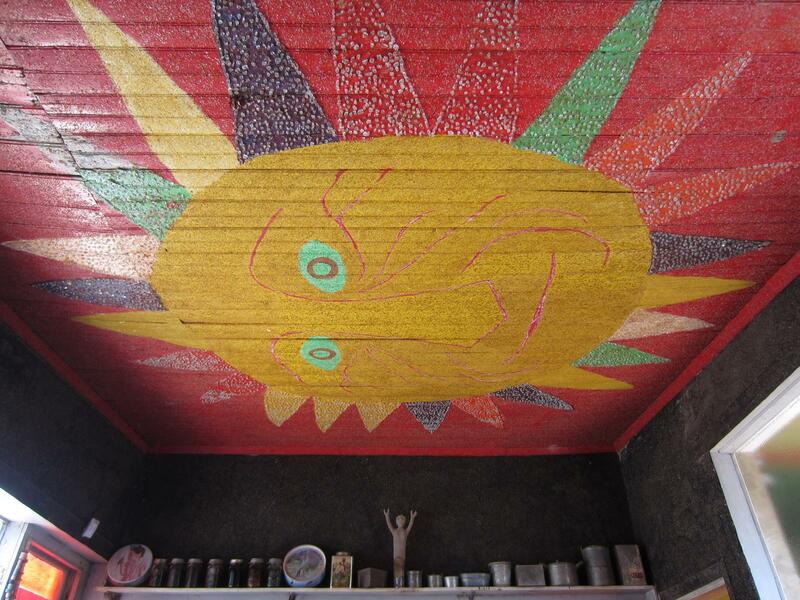 The ceiling of the pantry was brightly painted with a sun face. Red glass fitted to the windows gives the kitchen a warm glow. 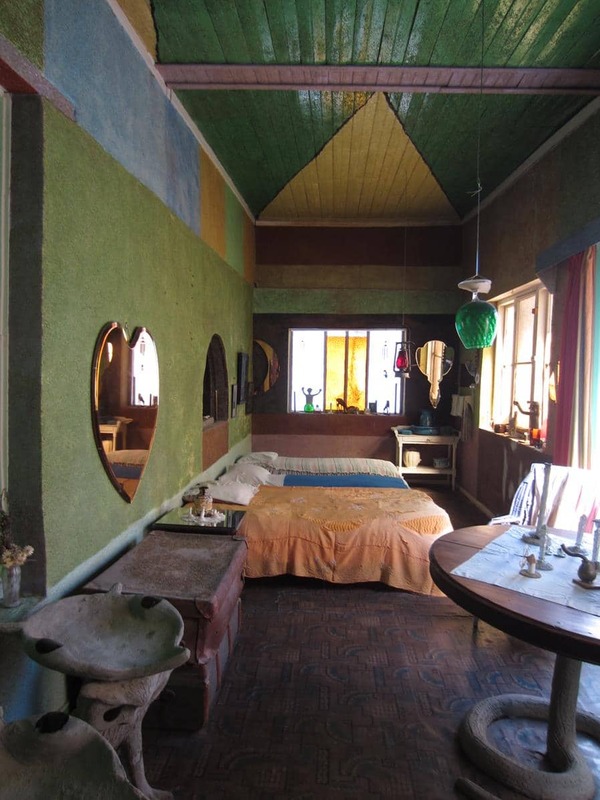 One of the bedrooms with a brightly painted ceiling and walls painted with crushed glass. When there was no more work to be done inside the house, she moved her focus to creating works of art for her garden. She was inspired by biblical text, the poetry of Omar Khayyam and the works of William Blake. 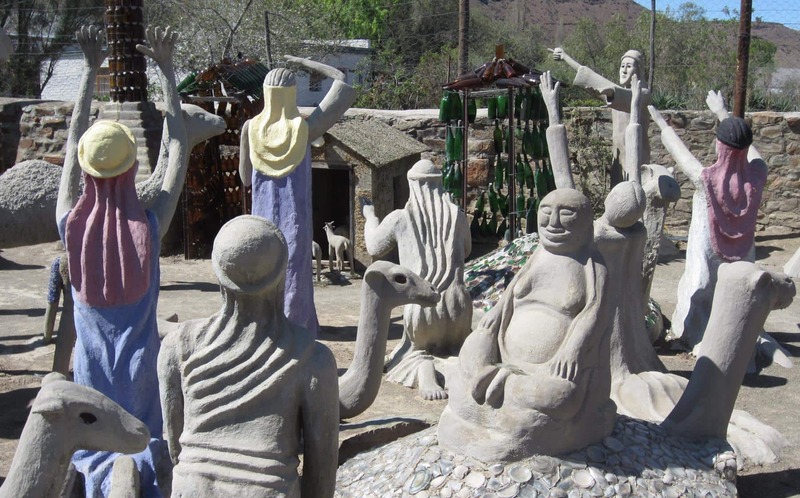 Over a period of twelve years she and her assistant, Koos Malgas, created hundreds of sculptures from basic materials like cement, wire and glass to fill her garden. 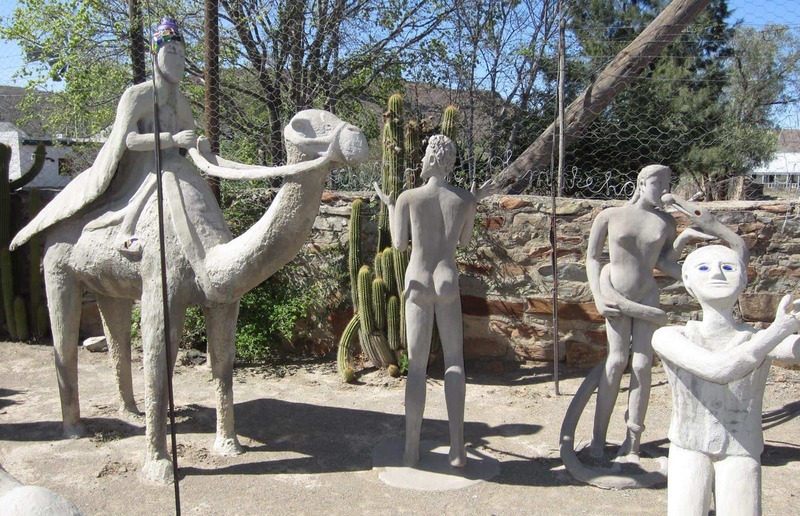 Beautiful sculptures on the back patio. One of the many maidens with bottle-tiered dresses. These sculptures vary from owls and camels to girls in elaborately bottle-tiered dresses and more. She integrated both Christianity and the orient in her art, with sculptures of a nativity scene next to a Buddha, sphinxes and sanctuaries of tiered glass bottles which she called her Mecca’s. A Buddha in amongst a nativity scene. The garden is filled with hundreds of sculptures. She was passionate about and lived for her art, until she took her own life at the age of 78. Now the local community makes and sells replicas of her work from stalls outside the Owl House. The museum is very informative, well-run and worth a visit. The entrance fee is R50 and a combined ticket for both the Owl House and Kitching Fossil Centre is R70. You can pay cash, by card or Snapscan. For children under two years, entrance is free. Daily visiting hours are 09:00 – 16:45 and during December school holidays 08:00 – 17:45. It is closed on Christmas day. The Kitching Fossil Centre tells the story of life in South Africa 253 million years ago. Many fossils were found here that explain the extinction event which destroyed most of life on Earth at that time. James Kitching was one of the world famous paleontologist who researched these fossils. 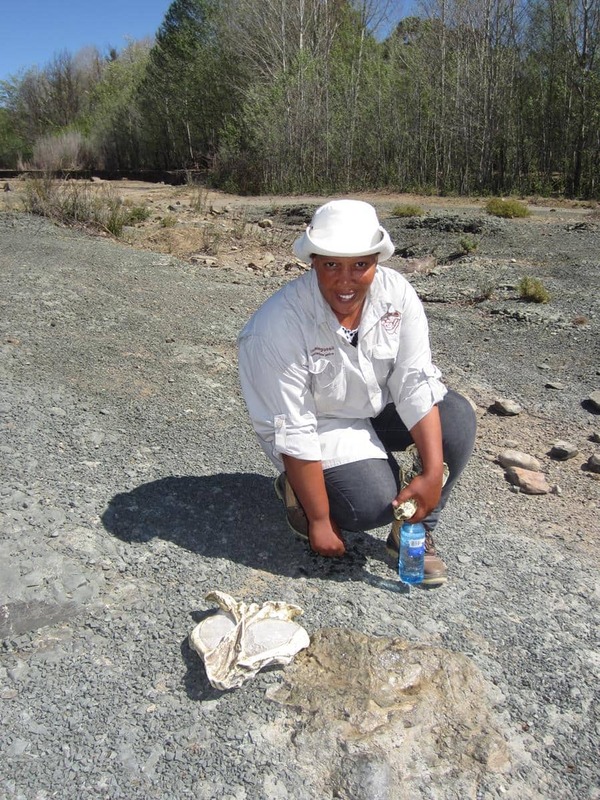 A visit to the centre includes a short guided walk to the Gats Riverbed where real fossils are still to be seen in the rocks. A guide points out a fossil that is still buried in the Gats Riverbed. 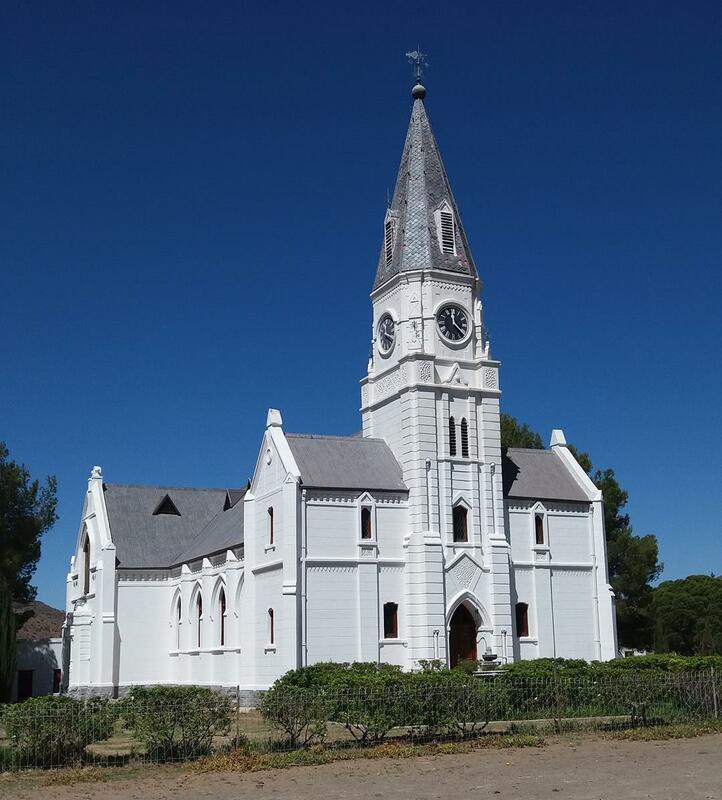 Nearby Graaff-Reinet is historic and beautiful and from there you would head for Willowmore and another quaint town in the Little Karoo, De Rust. 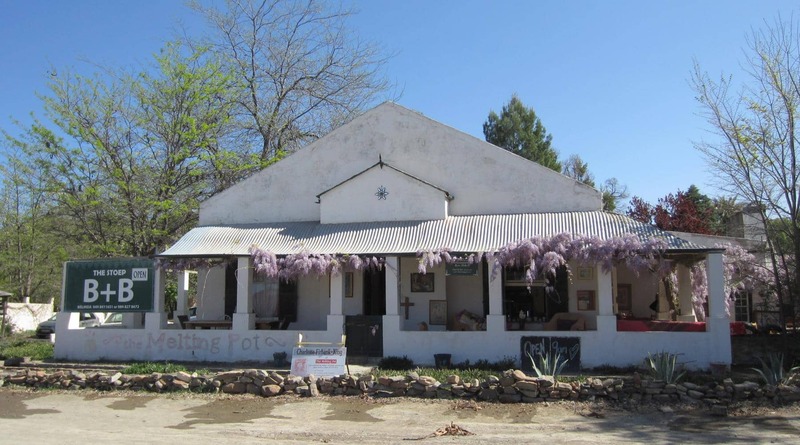 If you are heading for Cape Town or the Western Cape, it will be worth taking the scenic Route 62 which leads through beautiful landscapes and more interesting little places like Ladysmith and Barrydale. If you are heading for the Southern Cape you would head for George from De Rust via Oudtshoorn and the Outeniqua Pass. Be adventurous and take the interesting back roads this December holiday! 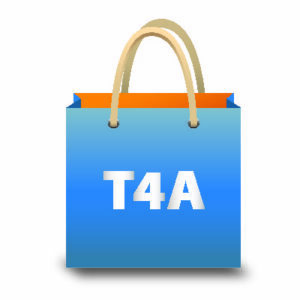 Don’t forget to load the latest version of Tracks4Africa on your GPS. This contains the Africa Guide, which has a lot of interesting supporting information. 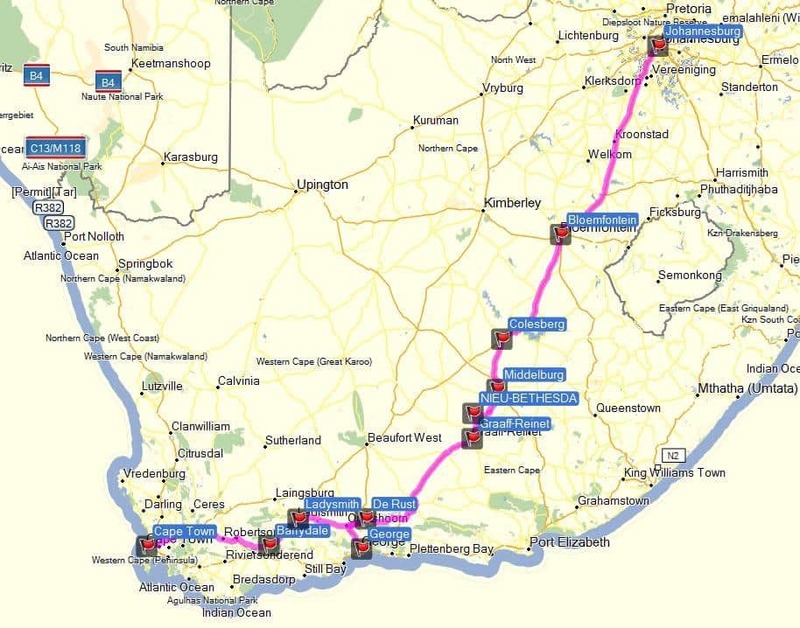 If you don’t have a GPS, this is also available on the Tracks4Africa Guide App, either for Android or Apple devices.